You hear miraculous stories in the news all the time—a man loses 370 pounds, another is able to return ten of his twelve medications at the pharmacy, and an epileptic child suddenly stops having seizures—each experiences a miraculous change in health, all from simply changing his or her diet. Fascinatingly, these stories all have one thing in common; the subjects started eating the opposite of what they had previously been told was healthy. The dietary guidelines they had learned growing up had failed them. Medical science has long turned a blind eye to such stories. But now the tide is changing, as more and more major studies are being conducted on what the body truly needs to survive—and the findings are alarming. The belief in eating less fat and less saturated fat is mistaken. Inadvertently, this advice may be the biggest reason behind the obesity and diabetes epidemic. It’s time to take a stand; it’s time for real food again! 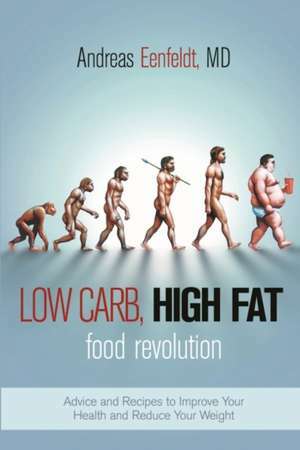 In Low Carb, High Fat Food Revolution, Dr. Andreas Eenfeldt takes the offensive by exploring the severe systematic failures on which many of today’s dietary guidelines are based. For Eenfeldt’s patients, the solution has been a low-carb, high-fat diet that allows you to eat your fill—and still lose weight. The book concludes with a guide section full of tips and recipes—everything you need to start your own food revolution. Andreas Eenfeldt, MD, is a Swedish medical doctor specializing in family medicine. He’s primarily interested in how food and lifestyle can improve a patient’s health and reduce their medication needs. He also runs one of the largest health blogs in Sweden, dietdoctor.com, and is a frequent lecturer for the public and for health professionals. For his blog, he reports daily about the latest health research, often from international conferences. Eenfeldt’s goal is to spread the word about outdated nutritional information and to push for a food revolution. He resides in Karlstad, Sweden.